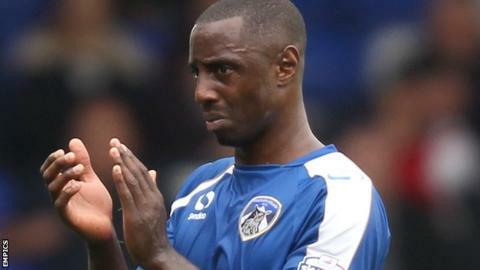 Oldham Athletic closed the gap on the League One play-off places to four points with victory over Rochdale. Mike Jones' 35-yard shot hit the bar but Rhys Turner put Oldham ahead after Mat Sadler's shot was saved. Rochdale, who were forced into three first half changes because of injury, went close through Peter Vincenti's shot and Ian Henderson's header. Jonathan Forte put away his own rebound for 2-0 before Turner rounded Jamie Jones to wrap the game up. The unlucky visitors, who would have moved into the top six with a victory, lost Vincenti after 20 minutes and both Jamie Allen and Stephen Dawson just before half-time. Reuben Noble-Lazarus sent his shot just wide of the post, before Rochdale were reduced to 10 men for the last 15 minutes as Ashley Eastham was forced off with injury. Mike Jones had a chance to make it four for the hosts but shot straight at his namesake Jamie Jones in the Rochdale goal, while substitute Dominic Poleon shot over from 25 yards. Match ends, Oldham Athletic 3, Rochdale 0. Second Half ends, Oldham Athletic 3, Rochdale 0. Foul by Bastien Héry (Rochdale). Attempt missed. Dominic Poleon (Oldham Athletic) right footed shot from outside the box is high and wide to the right. Substitution, Oldham Athletic. Timothee Dieng replaces Luke Woodland. Attempt saved. Andrew Cannon (Rochdale) right footed shot from outside the box is saved in the centre of the goal. Attempt saved. Michael Jones (Oldham Athletic) right footed shot from outside the box is saved in the centre of the goal. Delay in match Ian Henderson (Rochdale) because of an injury. Jonathan Forte (Oldham Athletic) wins a free kick in the attacking half. Michael Rose (Rochdale) wins a free kick in the attacking half. Substitution, Oldham Athletic. Genséric Kusunga replaces Connor Brown. Attempt missed. Andrew Cannon (Rochdale) left footed shot from outside the box misses to the left. Attempt missed. Jonathan Forte (Oldham Athletic) right footed shot from the right side of the box is too high. Attempt saved. Jonathan Forte (Oldham Athletic) right footed shot from the right side of the box is saved in the bottom right corner. Corner, Oldham Athletic. Conceded by Jack O'Connell. Attempt missed. Reuben Noble-Lazarus (Rochdale) right footed shot from outside the box is close, but misses to the left. Corner, Rochdale. Conceded by Luke Woodland. Corner, Rochdale. Conceded by Anthony Gerrard. Corner, Rochdale. Conceded by Adam Lockwood. Substitution, Oldham Athletic. Dominic Poleon replaces Rhys Turner. Attempt missed. Bastien Héry (Rochdale) left footed shot from the centre of the box is close, but misses to the left. Goal! Oldham Athletic 3, Rochdale 0. Rhys Turner (Oldham Athletic) right footed shot from very close range to the bottom right corner. Assisted by Jonathan Forte. Corner, Oldham Athletic. Conceded by Ashley Eastham. Connor Brown (Oldham Athletic) is shown the yellow card. Goal! Oldham Athletic 2, Rochdale 0. Jonathan Forte (Oldham Athletic) right footed shot from the centre of the box to the bottom left corner. Attempt missed. Michael Rose (Rochdale) left footed shot from outside the box is just a bit too high. Adam Lockwood (Oldham Athletic) wins a free kick on the left wing. Foul by Reuben Noble-Lazarus (Rochdale). Second Half begins Oldham Athletic 1, Rochdale 0. First Half ends, Oldham Athletic 1, Rochdale 0. Tom Kennedy (Rochdale) wins a free kick in the defensive half.